When Plain Joe Studios does spacial storytelling, that often involves creating characters to aid in telling the client’s story. 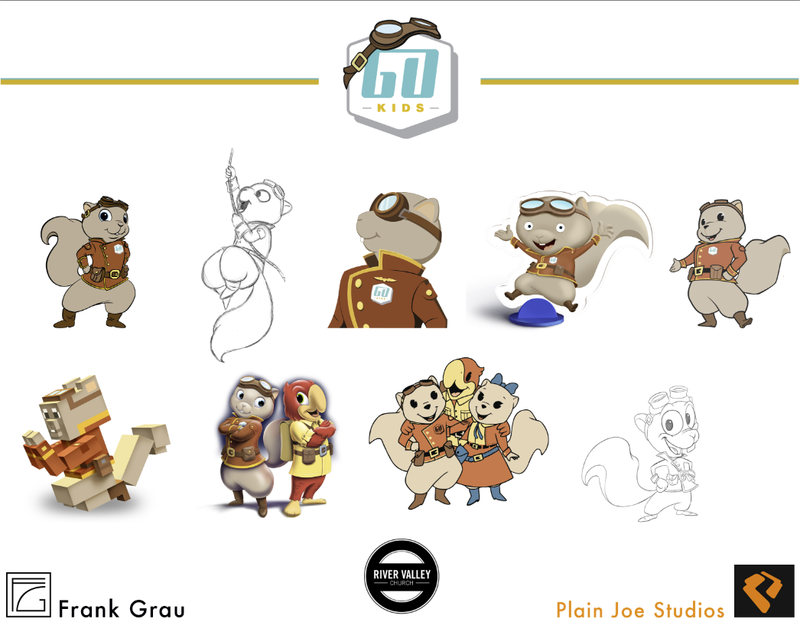 One of the characters we created as part of the Go Kids cast was a squirrel named Tom E. Over the years I’ve had to create different iterations of this character for different applications. Justyn Smith of River Valley Church took the various renderings I did and assembled this for a side-by-side comparison. That one on the bottom-left was supposed to look like TomE. if he were in the world of Minecraft. You might think it should be easy to copy a character made up of blocks, but it was actually more difficult than doing something organic; it was very time-consuming to get all the angles and shading precise enough to fake a character made of blocks in a 3D digital space (I hope to learn SketchUp and/or some 3D program in the future to streamline these kinds of tasks). In a future post, I’ll share the entire image with the faked Minecraft background illustration. That iteration on the bottom-right was a sketch I did when asked to imagine the character in the wacky style of Nickelodeon’s Ren & Stimpy. It was never used because, well, I guess after seeing how goofy the character looked when adapted into that style, they decided it wasn’t a direction that suited the character. How about that version of Tom E. on the blue stand; can you guess what that was done for? Plain Joe Studios commissioned me to illustrate a children’s book, Tom E. Squirrel Saves Christmas Cheer, in 2016. The book was written by Justyn Smith and Monica Morgan for the River Valley Church children’s ministry, Go Kids.